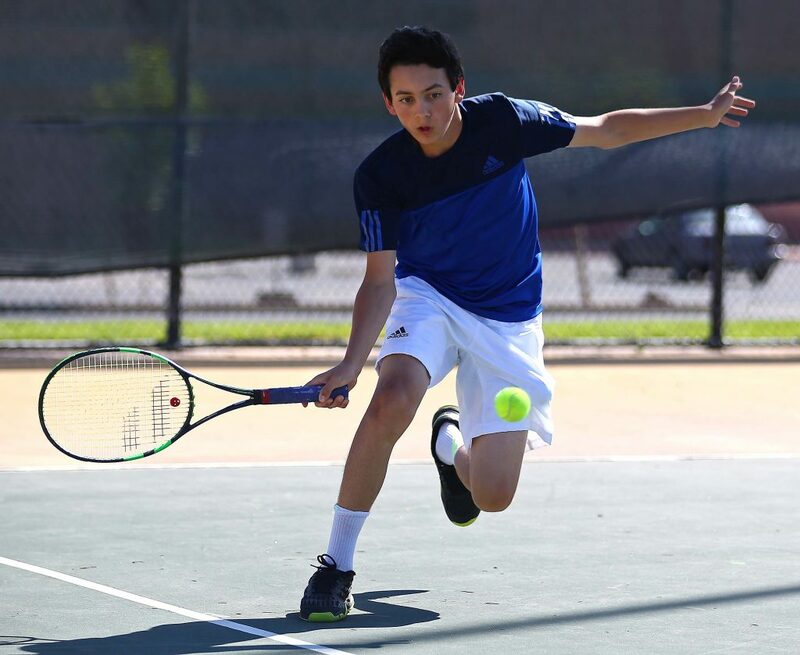 SALT LAKE CITY – Dixie’s Stefan Balian was the only 1st Singles player from Region 9 to survive the first day of the state 3A tennis tournament at Liberty Park. Balian won both of his matches in impressive fashion and will play in Saturday morning’s semifinal against Bear River’s Steffen Rigby for the chance to play for the state title. Rigby is the defending state champ. The freshman Balian won twice, but the other three 1st Singles players from the region didn’t make it past the first round. In fact, the only other Region 9 singles netter to survive the first day was Desert Hills junior Jake Hardy at 3rd Singles. He’ll play Rayden Ogborn of Bear River in the 3rd Singles semifinals first thing Saturday. But, while only two of 12 singles players from southern Utah survived to the semis, things went much better for the Region 9 doubles teams. Of the eight remaining doubles duos, six hail from southern Utah. 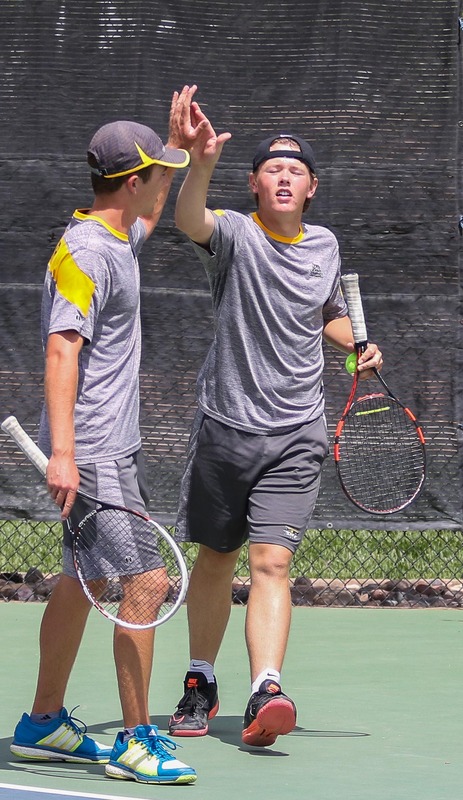 At 1st Doubles, region champs Conner McArthur and Josh James of Desert Hills won both their matches in straight sets. They’ll play the Park City duo of Charlie Lambert and Alex Burkemper in one semifinal. Lambert-Burkemper needed three sets to defeat Region 9’s No. 4 seed, Hyrum Sorensen and Gibson Crawford of Pine View. On the other side of the 1st Doubles bracket, the duo of Matt Morgan and Broden Lund dropped just two games in four sets in getting to the semifinals. They’ll play Region 9’s Daniel Bethers and Carson Bottema (Dixie) in the other semifinal. Bethers-Bottema won both their matches in straight sets to set up the Region 9 semi at state. 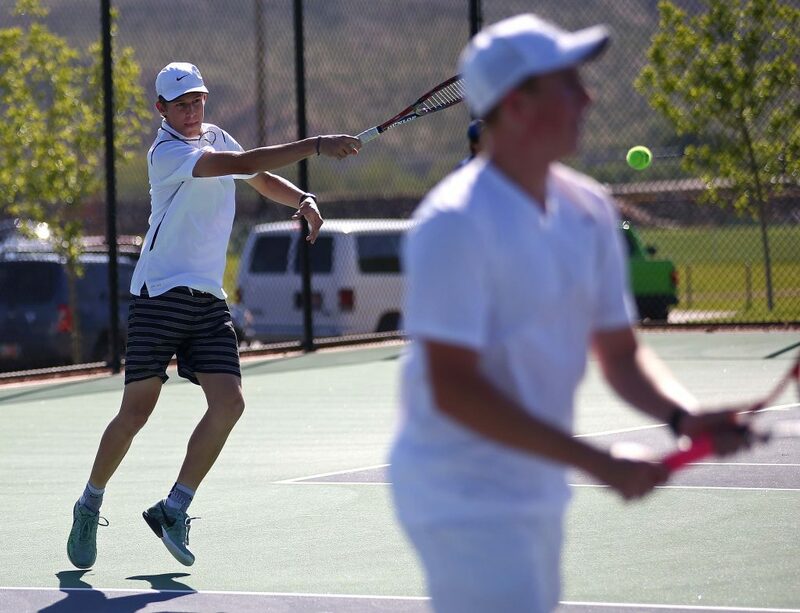 Morgan and Lund have been playing as a doubles team for just 2 1/2 weeks, but Snow Canyon coach Jeremy Atkin said the improvement in that short period of time has been remarkable. At 2nd doubles, Snow Canyon got a huge upset when No. 4 seeded Tanner Deal and Cade Thorkelson knocked off Park City’s Quinn Decesaris and Colton Stephens in the first round, 6-4, 6-3. Deal-Thorkelson then ripped through the quarterfinals with a 6-0, 6-1 pasting of Logan’s Jack Clifton and Michael Summers. Deal-Thorkelson will play a familiar foe in Pine View’s Futo Ide and Nathan Obray in one semifinal. The top seeded duo from Region 9 lost just one game in the first round in a two-set sweep of Grantsville. But Ide-Obray needed to gut out a 7-5, 7-5 quarterfinal win over the Ridgeline duo of Eric Ellis and Decker Robinson to advance to the semis. On the lower half of the 2nd Doubles bracket, No. 2 seeded Noah Thompson and Ethan Anderson from Desert Hills won in straight sets in the first round, then had a three set thriller in the quarterfinals. Thompson-Anderson beat the top-seeded Bear River duo of Tyson Hewlitt and Aaron Evans 5-7, 6-1, 6-2 to get to the semifinals. They’ll play Stansbury’s TJ Thomsen and Brady Kimberling in the other 2nd Doubles semifinal. Park City leads the team race by a point over Bear River and two points over Desert Hills and Ridgeline. Pine View, Snow Canyon and Stansbury are three points behind, but with a bulk of the points being earned on the second day, the Miners look like the favorite to take the team title. Park City has a semifinalist in every category except 2nd Doubles. Bear River also has a shot with semifinalists in all three singles categories.